As the A/W product has started to come in thick and fast I just can't resist all the layers and textures! As you all know by now my style is dark and experimental and this week in style is no exception! Full of feathers, netting, studding and PVC this winter looks dark and gothic which is right up my street! This new tee by Topshop is gorgeous and has an almost baroque gold raised print over it. Topshop has some amazing fashion jersey pieces out recently including this one and they are great and cheap to update your wardrobe! How amazing would it look layered over the tulle jersey dress next to it?? Oooof! How cute is this?! These scream at me as a must have for winter layering! Layer under dresses or with jumpers and leather for that hard and soft feel. Chunky black boots and fishnets will make this dress feel ultra grungy and so Topshop! It also comes in pale pink and grey and Is a must have for the transition period! Every year Topshop do a wonderful feather cape of some sort and I always want one! They look fantastic with knitwear and layered over leather jackets and create dramatic outfits- it's all about the drama! I am a big fan of fishnet and anything netted so when I came across this top I fell in love! I love the sporty feel to it and think it will look great in and all white ensemble and premium look! 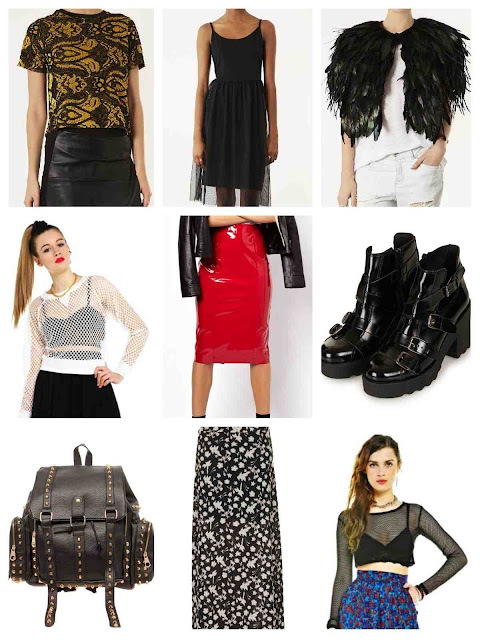 A PVC vinyl skirt is set to be every girls 'must have' item for AW13 so make sure you grab yours early! I have just brought one very similar from Topshop in pastel pink and can't wait to rock it with a fluffy cropped jumper next season! Red is set to take over In AW so why not say it loud with this ASOS red PVC skirt which is super sexual! These are the boots of my dreams and one of those things when seeing them I just had to have them! I love the chunky heel and the heavy strapping and buckle detail! They look fantastic on and add a touch of grunge whilst still feeling premium. Since buying my first rucksack when I moved to London it's became a necessity! Somewhere I can carry my life round with me and be prepared to work, the weather and life! This studded one from Boohoo is perfect for just that and I love the studding detail which makes it a bit more flash than my plain black one! While the weather is still warm I always like to have lots of maxis and trousers as they are practical for work! I love the print of this and think it will look amazing with boots and fringing! It will also look great with a jumper for AW so a perfect addition to my wardrobe! Yes another fishnet top and yes another one from Mee Mee! If you haven't checked the website out then do! They have some wonderful pieces including these 2 tops I have featured in this post. Reasonable prices and great quality these 2 tops are perfect for layering and can't wait to blog with them! Evidently, chronometer fake rolex sale licensed through the Glashutte Observatory tend to be actions that are examined within the situation. This really is in contrast to COSC chronometers that are actions which are breitling replica outside the watch situation. The actual distinction issues, along with a much better sign cartier replica uk with real-world overall performance is actually obviously provided whenever actions tend to be examined following becoming just about all cased swiss replica watches. This particular description regarding German born chronometers is essential as well as rolex replica clarify the actual "Chronometer" phrase that is imprinted about the call of the cheap replica watches, instead of the actual "Chronometer" content label that is replica watches sale about the call associated with, state, the Switzerland Rolex watch. German born Chronometer accreditation is not the one thing that swiss replica watches the actual in-house-made Glashutte Unique quality 58-01 motion to be unique. Up to now, we don't think which every other Glashutte Unique actions run within precisely by doing this, besides the quality 58-04 (a good development) that is available within the later-released Glashutte Unique Senator Chronometer Regulator.